Kaijudo Tournament Report: ARGCS Richmond! 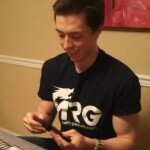 You are here: Home / Kaijudo Tournament Report: ARGCS Richmond! How's it going, everybody? I'm back with yet another tournament report! The Alter-Reality Games Circuit Series made its way to Richmond, VA last weekend, and the Kaijudo event it brought was my last competitive Kaijudo event of the KMC season! Since Richmond is only roughly an hour and a half from my house, I basically had to go, and Theo Wadley gave me a ride along with Carl Miciotto (who was judging the event) and Steve Boram. Though not a KMC itself, with over $1,000 in prizes, there was still a lot on the line. I did wind up making a last-minute decision in coming to that final list in cutting the second Lyra I had sleeved for a snap inclusion of the third [ccProd]Oathsworn Call[/ccProd]. When I got to the event (which turned out to be a rather depressing 16 people), I realized I knew everyone there except one person, and I was seeing a lot of aggro and tempo strategies. Based on that alone, I thought the third Oathsworn would be more valuable, but I think I was wrong in hindsight. There were a fair share of dragon and ramp/control decks there, and Oathsworn being both a multi-civ and a spell hurt me a little more than I would have liked. Anyway, on to the event itself! Since there weren't 17+ people in attendance, we'd be dealing with a four round event followed by a cut to top four. It was a precarious situation that meant every single match counted a LOT; an x-1-1 record more than likely wasn't gong to cut it for anybody. In an event of this size, it's not unheard of to play against someone you know round one, and again, since I knew everyone there except for one Megabug player, the odds were pretty stacked against me. Sean's a player from my local who you may have read about in a number of my other tournament reports. The matchup itself is rather interesting. On one hand, tempo generally does very well against control decks such as these, but when my teammate Spencer Swan originally built this deck for the Roanoke KMC (I noticed Sean's build looked similar), he built it with tempo in mind. There are definitely some problem cards to worry about; besides the end-game of the deck that can put the nail in the coffin against tempo for obvious reasons, cards like [ccProd]Major Ao[/ccProd] can be a problem if you don't play around them correctly. Still, not having powerful Darkness Shield Blasts and [ccProd]Mesmerize[/ccProd] can present its own set of problems. I dealt myself a rather strange hand in game one, seeing all of my [ccProd]Sword Horned[/ccProd]s and five multi-civ cards total in my first seven cards. It was a situation that could either have turned out very well or very poorly, but I was at least able to summon my first [ccProd]Sword Horned[/ccProd] on turn three. Sean didn't have a play, so I jammed another [ccProd]Sword Horned[/ccProd] on turn four. I figured I was dodging the vast majority of his creatures, including the potentially problematic Major Ao, and without [ccProd]Bone Blades[/ccProd] or [ccProd]Terror Pit[/ccProd], he would have very few ways to deal with my board. Things took a sharp turn for the worse right after I declared my first attack, though, as a [ccProd]Tendril Grasp[/ccProd] cleared both the creatures I had summoned from the battle zone. This put me unbelievably far behind, and though I wasn't technically dead right there, there was nothing my deck could do to regain its footing in time and I lost game one pretty decisively. I got a better hand in game two from what I can remember, though a first shield [ccProd]Crystal Memory[/ccProd] allowed Sean to dig for some options. The critical turn came a few turns later - I evolved a creature into [ccProd]Blinder Beetle Prime[/ccProd], giving myself the Prime and a Sword Horned to hopefully break his last three shields. As soon as I attacked with Prime, two Shield Blasts were revealed: [ccProd]Crystal Memory[/ccProd] and [ccProd]Tendril Grasp[/ccProd]. Those Tendril Grasps really had it out for my Sword Horneds! [ccProd]Andromeda of the Citadel[/ccProd] came down for Sean next, and since I wasn't able to get him down to zero shields on the previous turn, it was basically impossible for me to win. A [ccProd]Stormspark Blast[/ccProd] the next time I attempted to come after Shields was all it took for me to be dead on board. A disappointing 0-2 defeat is never how you want to start a tournament, but there was nothing left to do but to keep trying to win and hope for the best. Ryan, another skilled player who has seen his fair share of KMC top eights, was running the same kind of Dragon deck he used against me in the top eight of KMC New Holland, PA. The Nature splash was included specifically to fight decks like mine. Oathsworn Call can essentially give many of his dragons Shield Blast, and we saw in my last match how much of a beating Tendril Grasp can be at the right time. I had the option of summoning a Rain-Cloud Kraken on turn two in game one, but decided against it. I then learned that the deck I was up against had been given an update to become faster, and [ccProd]Cyber Scamp[/ccProd] and a Fire Bird were soon beating me down. His aggro strategy almost killed me, but I was able to prevent losing the game with cards like Rusalka (both of them) and [ccProd]Blinder Beetle Prime[/ccProd]. Eventually, I was able to attack for game. I don't remember that game two was much to talk about, and I think I had a pretty good curve. [ccProd]Psychic Predator Rusalka[/ccProd] definitely put in a lot of work this match and was invaluable in its ability to lock down [ccProd]Herald of Infernus[/ccProd] while also preventing [ccProd]Jump Jets[/ccProd] from becoming live. In a move that would prove to absolutely wreck my tiebreakers, Sean lost his second round. I was then paired against Theo (my ride to the event), who was sitting at 0-2 and had to play up. If I lost, I'd be dead, but if I won, my tiebreakers would be horrid and I might not even be able to make the top four with a 3-1 record. Either way, I had to try. Theo was on the same basic deck he'd been running since Bronze-Arm Sabertooth was released over a year and a half ago, which basically consisted of early aggression, a moderate amount of ramp if Sabertooth didn't outright win the game, and the ability to follow up with bombs like [ccProd]Tatsurion the Champion[/ccProd] and [ccProd]Heretic Prince Var-rakka[/ccProd]. Though not a tier one deck, it was actually a pretty bad matchup for me if he could beat me down with more giant creatures than I had answers for. Game one took a long time. It wasn't one of those matchups in which I could just get blindly aggressive. I think this was the game that I also completely whiffed off a [ccProd]Broodmother[/ccProd], one of the most feel-bad moments of the day. [ccProd]Infernus the Awakened[/ccProd] was exercising its dominance over my entire gameplan for a while in the late game, but I was able to play [ccProd]Oathsworn Call[/ccProd] on either [ccProd]Rusalka, Aqua Chaser[/ccProd] or [ccProd]General Finbarr[/ccProd] which got rid of it for a turn. If Theo re-played it, he'd be able to kill one of my creatures and effectively prevent me from playing anything of consequence unless I could topdeck into my one outer, the one copy of Lyra. He basically handed me the game this turn by summoning Sabertooth on his Razorhide to attack over one of my creatures instead, which left me free to evo up, break his last shields, and attack for game. Game two also ended in a victory. Theo's early turns were significantly worse and he didn't apply any pressure to the battle zone until turn six. I was able to keep enough options to overwhelm him and take a 2-0 victory. This was another matchup that made me regret my snap decision to run three Oathsworn Calls instead of two Lyras. This whole match will actually be going up on ARG's YouTube channel, as I was given the Google Glasses for the round. Be sure to stay tuned to the channel, as the glasses will allow you to see my hand throughout the match and the specific plays I made. Incidentally, they also gave me a mild headache that fortunately did not affect the match. Key cards in this matchup were anything that could keep cards flowing into my hand or prevent him from doing what his deck was supposed to do - so, [ccProd]Keeper of Laws[/ccProd], [ccProd]Broodmother[/ccProd], and Finbarr. I was playing around Major Ao most of the match since I assumed he was running it, but as it turned out, it was nowhere in sight. I think I won game one after he only hit one darkness card with Kalima; if he had hit two he would have had a better chance at surviving, and three would have put me in a bad position. In game two, I was on the play at Tyrone's request, a sign that he had [ccProd]Mesmerize[/ccProd]. I put down Psychic Predator in mana on turns one and two, simply intent on keeping Laws and double Broodmother in my hand. Mesmerize did indeed happen on his turn three, but my hand was full of powerful cards for the matchup. Eventually, I was able to do what my deck was supposed to do and take the match 2-0. Getting so close to the top cut and the shot at $250 prize credit for first place and missing due to such a poor situation was quite depressing, but I was happy with my plays and deck throughout the day. I think LWN was a pretty good call overall despite my questionable last-minute change. The deck is definitely one of the top contenders right now, and I feel like I did it justice, unlike my performance with LWD control in Ohio. My loss was to a series of events that made the games, given my opponent's shields and my hand, basically un-winnable. Those situations happen, and that's why 99% of competitive events have a cut to the top eight that includes everyone who went x-1 (or in x-1-1 in a lot of cases). If there had been one additional person, a draw in round five would have put me at 3-1-1 and a lock for a top eight, but it just wasn't in the cards this weekend. On ARG's part, the event was fantastic. I already talked about the great prize support, and the event itself ran very smoothly with little downtime between rounds. More people simply need to attend the Circuit Series and similar events around the continent so they can continue happening for the Kaijudo community! A special shout out has to go to Steve Silverman for winning with a LWF Dragon Tempo deck he borrowed from Carl right before the event, and Rob Wolinsky for taking second with Alex Blue (LW Cyber Lords). For those interested, you can view the finals on Carl's YouTube channel, "EarthP0w3R." That about does it for this report! I hope you all enjoyed reading and are able to make it out to a Circuit Series near you in the future to experience these great events. Make sure you keep checking ARG's website and Facebook page for information regarding upcoming events, and until next time, Play Hard or Go Home!